Packing for any type of getaway can be stressful especially during the holidays. Making sure you are equipped with the right beauty essentials doesn’t have to be! Whether you’re headed to the slopes or to dip your toes in the sand, these products have you covered. IOPE UV Defense Sun Protector SPF 50+ ($32): This lightweight sun protector strengthens the skin barrier while providing protection against harmful UV rays. Its grease-free formula absorbs into the skin quickly, controls shine, & moisturizes skin. KORRES Greek Yoghurt After-Sun Cooling Gel ($26): Soothe your sunburn with the power of epilobium angustifolium, fennel extracts, and Greek Yoghurt to help promote the moisture recovery of sun-harassed skin. This exceptionally calming cream-gel provides long-lasting freshness and comfort to the face and body. Bioré Witch Hazel Ultra Deep Cleansing Pore Strips ($6.49): The perfect way to get your skin extra clean after a day in the sand. 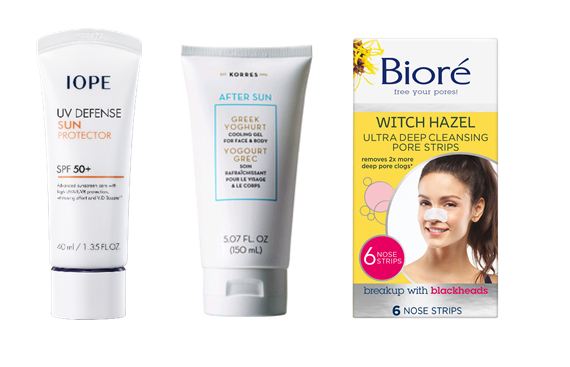 This new edition to the cult-classic line of Bioré Pore Strips uses Witch Hazel to pull out 2x more deep-down dirt for the deepest clean you can see. With just one use, lift away pore-clogging dirt, sunblock, oil and blackheads for purified pores. LAVANILA The Healthy Deodorant, Elements Collection ($14 each) After breaking a sweat on the mountain (or on the beach), freshen up with this new lineup of fresh, energizing deodorants that takes natural to the next level. Inspired by some of the elements of nature — earth, air, fire, and water— the unique deodorants in this collection are infused with pure essential oil blends that bring the elements to life. IMAGE Skincare VITAL C hydrating overnight masque ($55): This overnight treatment is the perfect way to keep your skin hydrated and moisturized after some windburn. The gel-texture delivers water to the skin and locks in vital nutrients while you sleep, helping to smooth skin and diminish wrinkles. Wake up feeling hydrated and glowing. 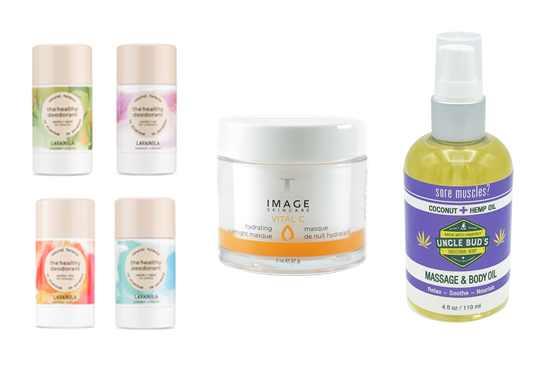 Uncle Bud’s Hemp Massage & Body Oil ($19.99): This versatile, fast- absorbing, coconut-scented body oil is a great way to hydrate your skin after being in the cold. Plus, the natural hemp helps to relieve any aches and pains you may have gotten after conquering those black diamond trails.